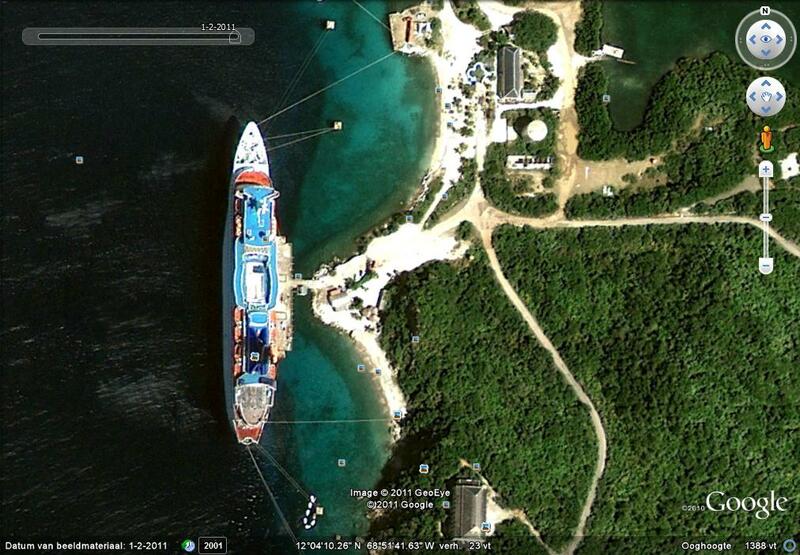 Re: Cruiseships on Google Earth. I think the left 3/4 of the ship looks like Carnival Destiny I'm going by the water slide mid ship and they skylight and pool on the aft end and that Wikipedia says she's based in Miami. Then for the right 1/4 I think it's the stern of Carnival Imagination the only Fantasy class based in Miami. That stern water slide is pretty distinctive. I wouldn't be surprised if something like this actually is proposed. I proposed X-bow on Cruise ships some time ago. That would make it possible to make the bow a revenue earning area. The reason why I commented on this in more technical details is that I did come across an Accommodation Barge where they had "squared off" the bow to get more deck space. 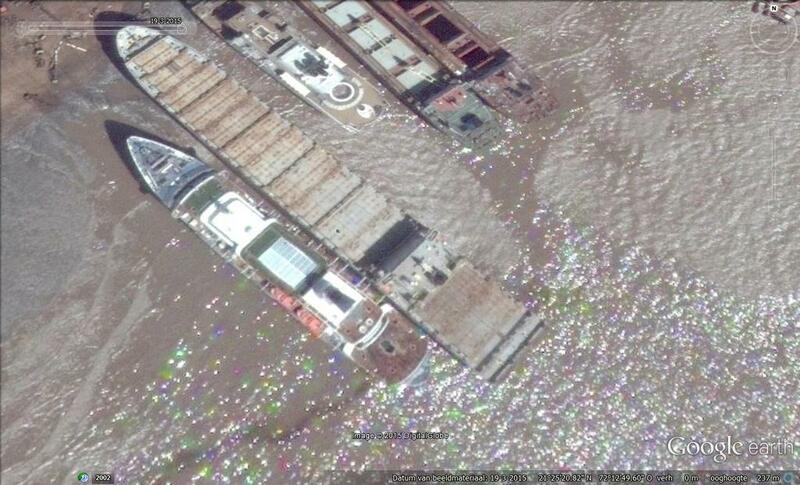 I just checked and the double sterned ship is only visible on Google Maps. 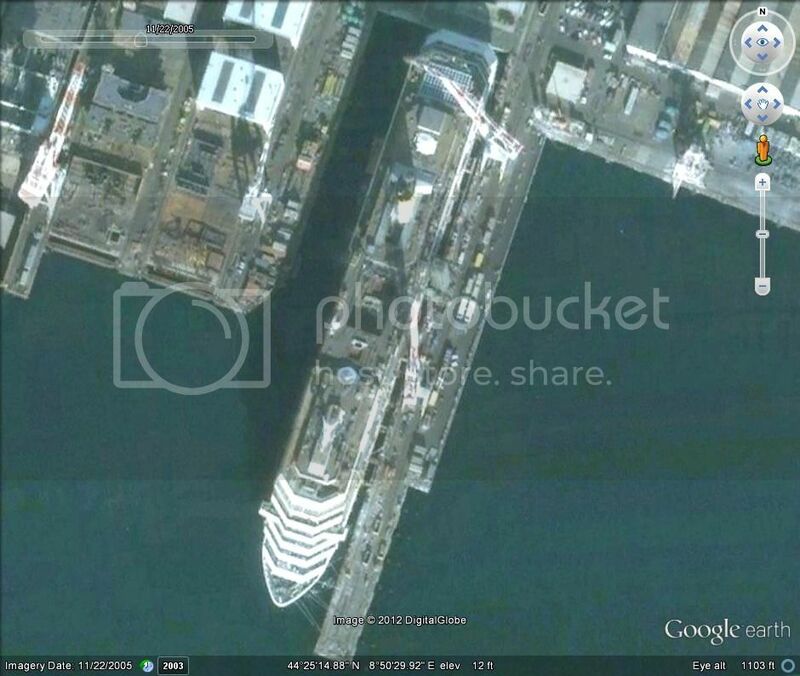 I don't know if anyone has spotted this new Carnival ship on Google Earth/Maps yet. She's docked in Miami. She's not visible until you zoom in close enough where the imagery changes and this new cruise ship design appears. Apparently Carnival has figured a way to offer more pool and deck space by eliminating the bow. PS. I posted this without reading the rest of the thread forward from Dane's original post, so did not spot that Dane had already sussed out the mystery stern section (Carnival Imagination), but finding the Norway there made my brief look worthwhile after all. 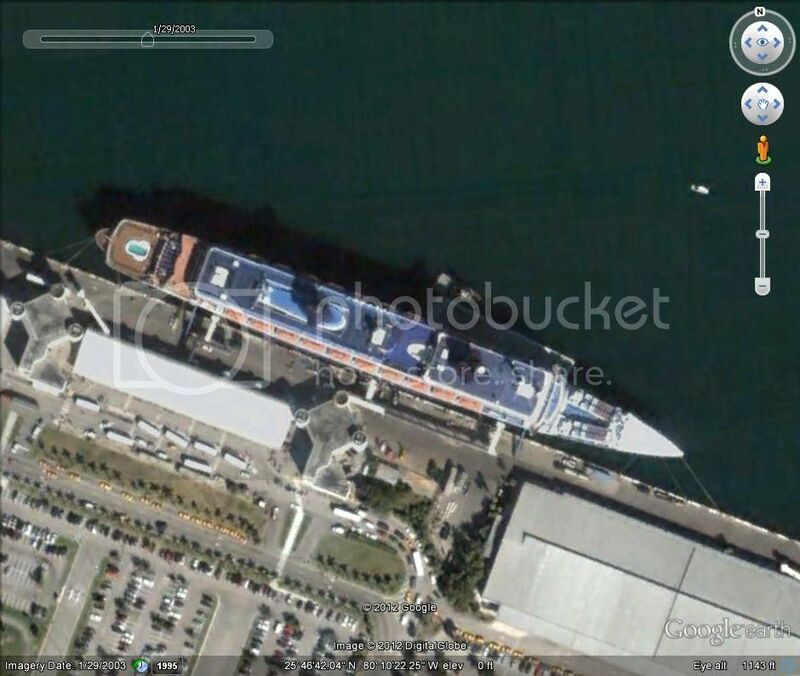 Google Earth captures an image of the ill fated Costa Concordia, just weeks away from being finished and fully fitted out. I have just been reading about her early life, i am not normally overly superstitious, but having just read that during the naming ceremony, the bottle failed to break against the hull on the first attempt, maybe there is something to that particular superstition after all. Source - A short history of the Costa Concordia. Last edited by Steve.B; January 12th, 2013, 17:12.
from the beaches of Alang. have the idea that it are both princess cruises vessels. The passenger ship at the foot of this photo #100 looks like Discovery. that was the first what came up to me too.i placed it in my image folder as discovery. the funnel head is typical pacific cruises,as we have seen for years on the tv show yhe love boat. So we are both right. Discovery went on to the beach at Alang and MidShipCentury has got a lot of her fittings. If you look at the photo at the top of their Facebook page https://www.facebook.com/pages/MidSh...s/116704149386 and then look down through recent posts (currently 3rd) the ship's fittings are mentioned as coming from India. Studying them section by section I don't think the last two are the same boat, and I doubt if either are the boat in #99.
no there not the same,only those in post 99 are/looks the same vessel, but 13 in a dozen. Which are you comparing with which now? I'm just back from Germany, and was only going to have a quick peep on CVF, but here's an immediate interesting distraction from essential tasks! Yes, I agree janihudi and Gailsail that the ship in #100 is Discovery. As well as that ship's appearance fitting Discovery, it is also in exactly the right place! 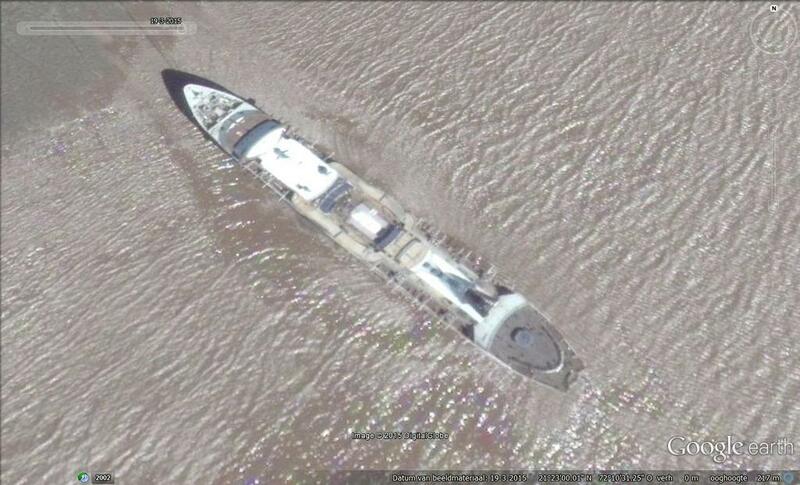 I had kept the AIS track when, then renamed Amen, she was beached in Alang - displayed on a Google Earth background similar to the one Bengt shows in his last picture on the post #258/2 of Discovery's thread. Of course the ships shown then predate the beaching, but here is a hugely enlarged detail so that you can see the details of roads and surroundings on land nearby. I've now gone to Google Earth to capture a similar view showing the land, and you can see the improvement in the imagery Google Earth is now using for this area, which is dated 19 March 2015. Last edited by Seagull; July 6th, 2015, 15:34.